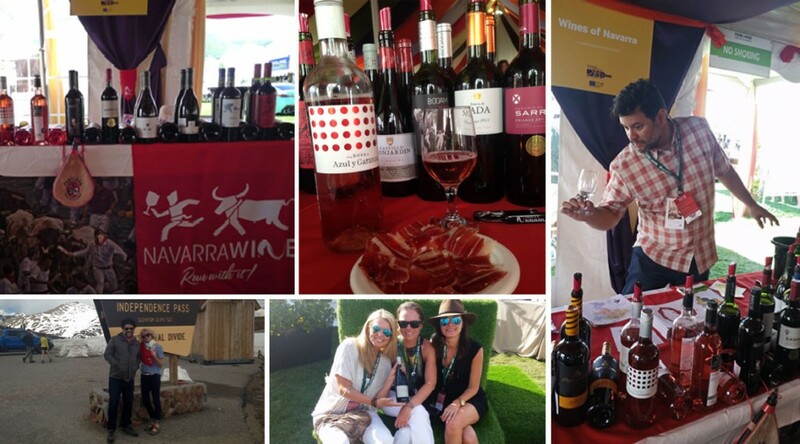 Wines of Navarra rocked it at the Food & Wine Classic in Aspen, where the best of the best in the culinary and wine worlds flock each year to see, be seen and most importantly, eat and drink, in this high-profile ski town in the summer. The event, now in its 32nd year, is the place to be in June and Navarra was there with a premium spot in the Wines from Spain tent serving 20 of their finest wines to the 5000 attendees over the course of this very fun weekend. The Navarra table even had a surprise visit from fellow exhibitor and actress Drew Barrymore! – Inside the tent, near the entrance—our Wines of Navarra table ready to go! – “Spanish Breakfast” with our neighbor’s jamon #Fermin. – Wines of Navarra Brand Ambassador Adrian Murcia at our table. – Jane Walsh and Adrian Murcia at the highest elevation on the Independence Pass / Continental Divide in the Rockies on our way to the Food & Wine Classic in Aspen for Wines of Navarra…. – Lovely Wines of Navarra supporters!